It has been about a year since I updated you all on my hair removal progress. Mostly that has been because over the last summer I stopped using it as you are not supposed to use it if you are getting a tan, and with all of my outdoor activities I generally do tan quite a bit. Thus I stopped for the summer, but I had fully intended to continue using it once my tan faded. Alas, life got in the way and I did not zap myself nearly as much as I would have liked over this past winter. And what do we have quickly approaching us again? Yup summer! Well, even though that bothered me a bit and I was quite annoyed with myself that I didn't do it more, I realized that really said something about the effectiveness of this product. I only used it on my body maybe three or four times last year and the resulting hair growth was so minimal that it really didn't bug me that much. Oh sure, I still have hair growing where I would prefer to not have hair growing, but it is seriously diminished. So much so that it doesn't bother me nearly as much as it did when I originally began this adventure. - My arms are almost basically hairless. I still shave them but I often wonder why as I generally don't even see hair on them. That is fantastic! I really don't even feel stubble on them anymore. Woo-Hoo!! So on the arms this was fantastic! - My chest is also almost hairless. It does still grow hair that I notice, but gosh not nearly as much as it used to. I generally go about a week between shaves now, and even then it is super sparse and not nearly as noticeable as it used to be. - My lower legs are doing well, but they are still growing quite a bit of hair, maybe about half of what they used to, but it is a good result. - My upper thighs and bikini line still have most of the hair. But admittedly this is one of the hardest areas for me to zap well. Thus I haven't done it as much as my chest, which was really the most annoying area for me. - My belly still has most of the hairs growing. This area does annoy me and is generally the impetus for me shaving my chest/belly each week. The small fine hairs grow out, form stubble, and then proceed to poke me. Annoying. - Arm pits - I haven't noticed much hair diminishing from this area at all. 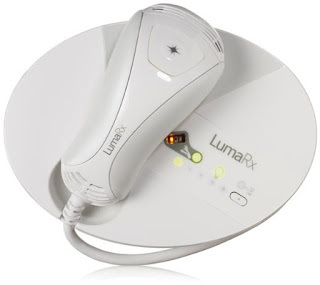 - I have not used any other IPL machines, but this is a quality product that has held up well over the past year. It is still delivering good light zaps. - This machine requires a large amount of pull from the electrical system in your house. I have had some difficulties with the machine beeping to me indicating that it can't draw the required voltage from the wiring. Most of my home circuits are 15 amp rated and it quickly heats up those lines and the machine wont function. It works better on the 20 amp lines I have. But even then, with trying to zap your entire body in one sitting, the machine itself will heat up and will beep and will not function anymore. This generally takes about an hour or two to occur, but it is still kind of annoying. Considering how much electricity it takes to operate I don't know if any other machine would function much better than this one. Maybe if there is a more "professional" level of machine it would handle more zapping at one sitting before over heating. Who knows? I don't! Overall, I am super happy with this purchase and I think it was well worth the money when you consider the costs of doing this in a professional setting and having to pay somebody else. I also like the convenience of pulling it out whenever I want. Boo-hiss body hair!! Well at least to me. Maybe if you are FtM, then you love body hair and want more. Can I give you mine?